Ruth Hirschman produced and narrated this biography of French singer Edith Piaf (1915 - 1963). The documentary moves from her difficult childhood in a working-class neighborhood in Paris, her rise to fame and stardom, her relationship with the boxer Marcel Cerdan, her struggle with drug addiction, and her early death at the age of 47 from liver cancer. Features clips of many of her songs. 1 reel (43 min.) : 7 1/2 ips. mono. 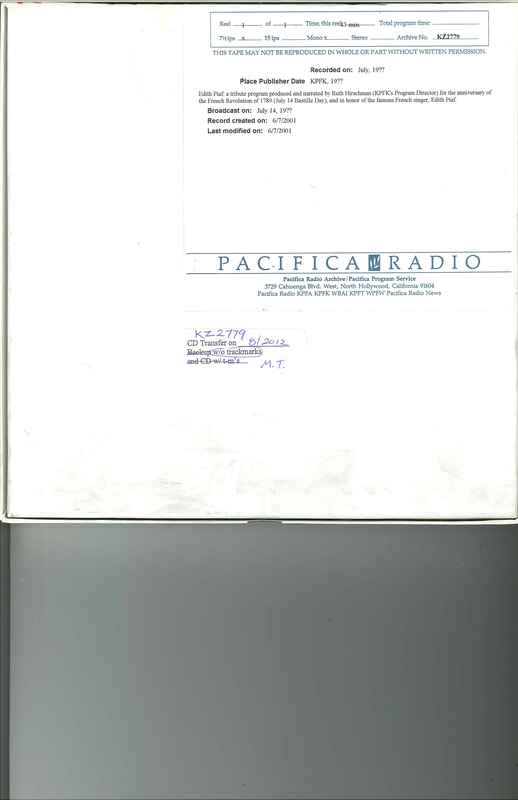 Los Angeles : Pacifica Radio Archive, 19? ?.